People sometimes ask me how I make up recipes, and I genuinely feel that an understanding of the individual flavours at play is the biggest factor. Practice and research and exposure to new ideas are all important, but there’s nothing more important than just tasting your ingredients. I realize that this might sound like strange advice coming from a person who writes recipes for people to read, but I think that anyone who wants to improve their cooking should spend a little less time focusing on measurements and instructions and a little more time just tasting things. I’ve been reminded of this over and over again this month as I try to explore the surprising variety of flavour found in green vegetables. My first taste of pea tips was revelatory, and I really don’t understand why not a more commonly vegetable. They’re ridiculously easy to use, and they taste unique and wonderful. They’ve got the same sweet and distinctive flavour that you get from peas, along with that slightly bitter edge, but with the added texture and taste of a leafy green vegetable. Perhaps there’s a cultural element at play; frugality has long been a key element in Chinese cuisine, with no part of a plant or animal wasted. In addition to pea tips (which are simply the tender greens of the snow pea plant), yam greens, pepper leaves, and the leafy greens tops of numerous root vegetables are routinely consumed in many parts of East Asia. Western chefs have occasionally embraced these tips and tops over the years, but there was certainly a tendency to relegate these ingredients to the status of animal feed (which is another form of frugality of course). But our collective interest in vegetable diversity has been growing as we try to dedicate more of our plates and our meals to plant-based foods. While I can appreciate that we are creatures of habit, apt to buy the same bunch of spinach time and time again, we are also creatures of great curiosity. So if you’re looking to get out of your habits and satisfy your curiosity, I can’t imagine a leafy green vegetable more perfect than the humble pea tip. Alright, so you buy a bag of pea tips at a Chinese grocery store and bring them home. Now what? You could simply swap out the greens from any Asian dish and end up with a wonderful product, but you might be doing yourself (and the pea tips) a bit of a disservice. What I mean is that just because you can treat most leafy greens the same way (I have a default Chinese stir fry that works with basically every green vegetable) doesn’t mean that every vegetable tastes the same. Pea tips taste… well, like nothing else. Consequently, they deserve some special consideration. In this case, that means taking a ‘less is more’ approach. There are so many delicious Chinese spices and sauces that work with virtually any ingredient, it’s easy to overdo things a little and lose sight of your basic flavours. But instead of falling back on the same (admittedly delicious) sauces, it’s worth stepping back from the stove for a moment and asking yourself what flavours you’re trying to highlight. Case in point – it occurred to me that this is one of the few Chinese dishes I’ve ever made that doesn’t use garlic. I wanted the the subtle pea flavour and sweetness of the pea tips to stand out without being overwhelmed by the pungent and savoury hit of garlic. Would this have been a bad dish had I included garlic? Probably not (is anything bad with garlic?). But when I took the first bite of this, I was struck not just by the wonderful flavour, but by the fact that it tasted different; it wasn’t just another variation on the vegetable-plus-savory-sauce theme. It was sweet and nutty, a little bitter, and vibrantly green, both in colour and flavour. The ginger livened up the whole dish without burying any of the flavours. It wasn’t just any vegetable dish. Now I appreciate that tastes for green vegetables run the gamut from die-hard fanatic to reluctant veg-o-phobe, but isn’t that what the ideal thing to do with any food – to allow us to experience it for what it is, rather than hiding it in the background? Returning to the question I get asked so often – I come up with recipes not by asking ‘what can I put this ingredient into?’ but ‘what can I do to let this ingredient be the star?’ It’s a simple approach, but it makes all the difference in the world. This is a very, very easy dish to prepare. There are only a few things to take into account. First, as with any stir fry, you want to make sure you get your wok (or large, heavy pan) extremely hot. Second, the pea tips reduce in size substantially, so make sure you stir them and move them as they cook to let them all wilt evenly. This recipe makes a side dish for 4 or a larger main (or part of a main) for 2. It can easily be doubled (or more), but cook any additions in batches; if the wok or pan is overcrowded, the pea tips will steam rather than fry, and the sauce won’t reduce at all. For more information on the basic techniques used to stir-fry Chinese greens, check out this post (part of a three-part series on cooking Chinese greens). If you want to make this a vegan dish, substitute the honey for a plant-based sweetener like agave syrup. GOOD NEWS:This dish is exceptionally healthy and nutrient-rich. Seriously, look at the vitamins! It’s also very low in calories. This is an ideal dish to serve alongside a starch or protein. BAD NEWS:It’s low on protein, but that’s being pretty picky. This is an exceptionally healthy dish – you could eat the whole thing guilt-free. Pea tips aren't too familiar outside of China, but they should be. They're incredibly healthy, delicious, and easy to use. Here the mild green taste is played against bright ginger and sweet honey. Combine the honey, soy sauce, and sesame oil in a bowl and set aside. Heat a large wok over high heat and add the oil. Heat for 30 seconds, then add the pea tips and ginger. Stir fry until the pea tips are are soft and very much reduced in size, about 1-2 minutes. Add the sauce to the wok and toss to combine. Stir fry for an addition minute, or until the sauced is reduced somewhat. 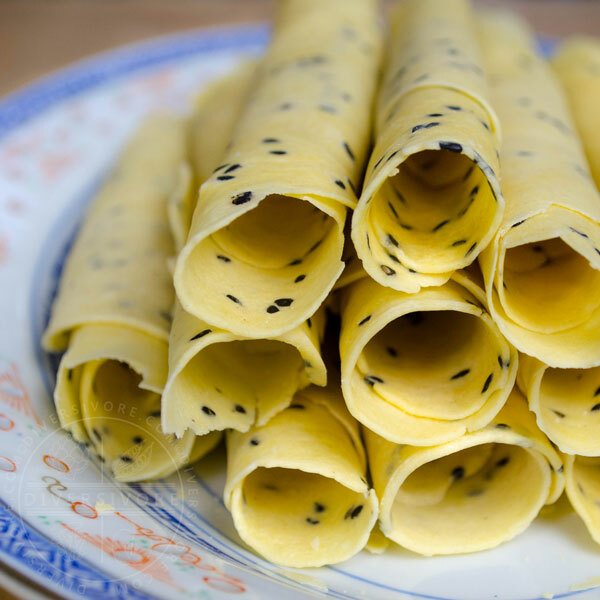 Garnish with sesame seeds and serve immediately. Honey can be substituted with agave nectar or another sweetener to make this dish vegan. Sean, what a terrific idea! 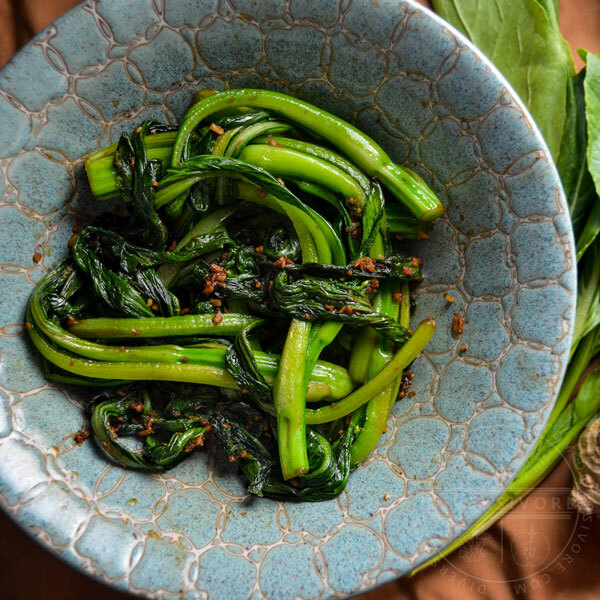 I feel like my default for cooking gai lan or bok choi is always first to mince up several cloves of garlic; but you’re right, it can be so wonderful to let the flavours of the greens shine through! These pea tips totally have my mouth watering! I especially love that second, close-up shot with the sesame seeds scattered into the dish. Beautiful recipe, and great inspiration, as always! These sound delicious.I love that it is so quick and easy too. It would be fabulous on a big pile of rice with a sprinkling of cashew nuts! Thanks Mel! I bet cashews would be really good. Actually I think peanuts would rock too – especially fried up with a little bit of chili in the Chinese style. The sauce has a really nice sweetness that I feel would partner well with any number of nuts. This dish sounds so good! I have never eaten pea tips before.. to be honest I don’t think I have ever noticed them in a grocery store. Where would you recommend purchasing them? Served with brown rice would make a fantastic dinner!! Thanks Meaghan! 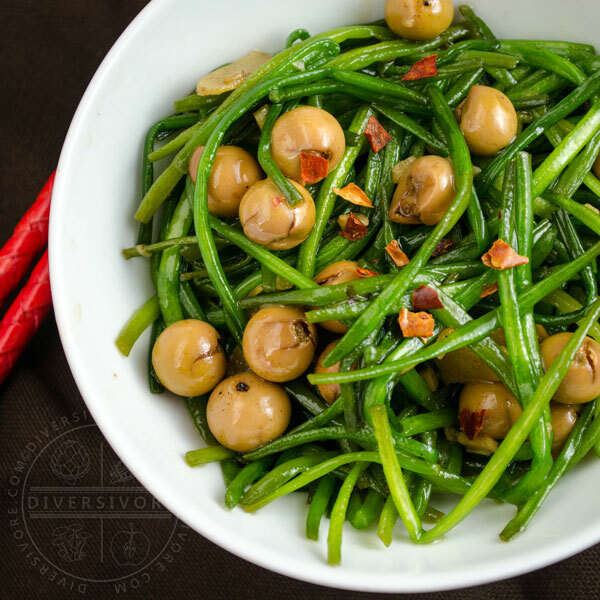 I’ve detailed everything you’d need to know about finding/choosing/using pea tips in this ingredient page, but to answer your question really briefly, you should be able to find pea tips at a Chinese grocery store with a well-stocked produce section. I love the idea about brown rice too – the sweet/savoury sauce and the sesame taste would partner really well with the nutty flavour of brown rice. I love the green tops of vegetables and just greens in general. This recipe has huge appeal for me. Beautiful site, by the way. I’m curious how you get your nutrient analysis for recipes. Are you willing to divulge your secret? I’m glad the recipe appeals to you Tiffany, and thanks so much for the compliments on the site. My nutritional analyses are a component of the recipe plugin that I use. It’s called WP Ultimate Recipe. There’s a very nice free version, but the features and customizability I get out of it come from the Premium version. I’ve been really happy with it, and I’m super pleased with the nutritional information function, as it’s been really easy to use. I hope that helps! Oh the amount of pea greens I’m going to have in the garden in June 🙂 Thanks for the wonderful recipe!! I’ve never thought of sautéing them and this looks delicious. Love the shot of the pea greens in the wok.